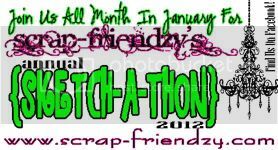 It's time to ring in the New Year with Scrap Friendzy's annual Sketch-A-Thon. Starting January 1st there will be sketches everyday, games to play, and lot's of prizes to win. Come join us in the fun and kick off the New year with a blast into scrapping.